This work reports a comparative study of two automated flow-through fluorosensors for the determination of digoxin in serum samples: an immunosensor with an anti-digoxin polyclonal antibody as the reactive phase permanently immobilised on controlled-pore glass and a sensor with a selective reaction system based on a methacrylic molecularly imprinted polymer (MIP) synthesised by bulk polymerisation. The variables affecting the sensitivity and dynamic range of the sensors (e.g. the carrier and elution solutions, flow rates, pH and reagent concentrations) were optimized, and the binding characteristics of their reactive phases were compared in a competitive fluorescent assay. Digoxin was reproducibly determined by both sensors at the milligram per litre level (detection limit = 1.20 × 10−3 mg L−1 and RSD = 4–7% for the immunosensor; detection limit = 1.7 × 10−5 mg L−1 and RSD = 1–2% for the MIP sensor). 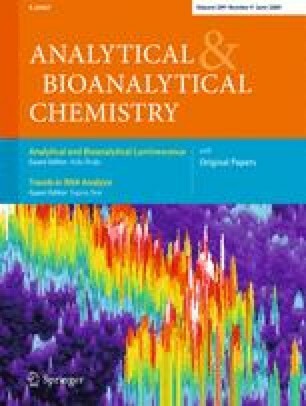 No cross-reactivity with digoxin-related compounds was seen for either sensor at a digoxin/interferent ratio of 1:100. The lifetime of the immunosensor was about 50 immunoassays; its shelf life, when unused, is about 3 months. The lifetime of the MIP sensor was over 18 months. Both sensors were used to determine the digoxin concentration of human serum samples with satisfactory results. This work was supported by the Spanish Ministry of Science and Technology (project CTQ 2006-15027/PPQ) and the Universidad Nacional de Educación a Distancia by the Plan de Promoción de la Investigación en la UNED. The authors thank Adrian Burton for checking the English manuscript.